Dome crown 60's vintage pillbox hat. Cream and mocha silk gazar. Cream stacked concentric gently folded tucks at crown. Self bow top. 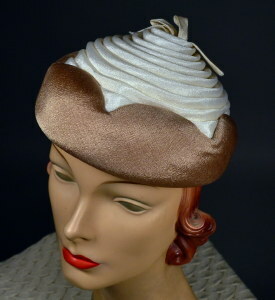 Mocha roll back brim with scallop edge. Wide roll back brim front, narrow roll back. Cinnamon grosgrain inner-band inside crown. Cream taffeta crown lining. Crown height - 4 1/2"
Hat diameter - 7 1/2"
Width, measured from side to side - 6 3/4"
Length, measured from front to back - 6 1/2"
Circumference (measured at brim edge) - 21 1/2"